Biarritz is a city in the southwest of France, located along the Atlantic coastline in the region of Aquitaine. Biarritz – Anglet – Bayonne Airport (BIQ) is located about 5 kilometres from Biarritz. Several airlines serve the airport, with destinations being London, Helsinki, Nice, Lyon, Geneva, Paris, Birmingham, Dublin, Marseille and Amsterdam. 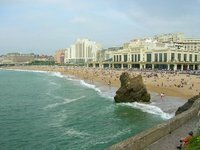 We have a comprehensive list of accommodation in Biarritz searchable right here on Travellerspoint. You can use our map to quickly compare budget, mid-range or top of the range accommodation in Biarritz and areas nearby. This is version 6. Last edited at 3:39 on Aug 2, 17 by sleepBot. 7 articles link to this page.